A European court has ruled that Lionel Messi, the world's top earning footballer, can trademark his own name. The Barcelona and Argentina striker fought a seven-year fight to be able to use his name on sports goods. His original application was challenged by the Spanish cycling brand, Massi, which argued that the names were too similar and would cause confusion. But the EU's General Court ruled that the footballer was too well known for confusion to arise. The ruling comes days after France Football magazine reported Mr Messi had overtaken Cristiano Ronaldo as the highest earner in football, with an income of €126m (£108m). Mr Ronaldo is making €94m, the magazine said. Mr Messi's application to trademark his name was made to the European Union Office for Intellectual Property (EUIPO) in 2011. It ruled against the footballer, saying the names were similar, because their dominant elements, "consisting of the terms 'Massi' and 'Messi', are almost identical visually and phonetically". But the General Court, the EU's second highest court, disagreed. It said on Thursday: "The football player's fame counteracts the visual and phonetic similarities" with Massi. 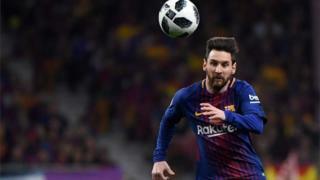 Widely considered one of the world's greatest soccer players, Mr Messi, 30, scored his 600th professional goal last month and is the all-time highest scorer for both Barcelona and Argentina's national team.